of vastly narrow structure (since 1998). Area of dissertation researches: domain names. Academic title: professor, RANH Corresponding Member. Scientific degree: Doctor in Law. Title of honor (RAHN): Honored worker of science and education. 2003 – WIPO Academy’s "General course on intellectual property". 2010 – WIPO Academy’s "Copyright and related rights". 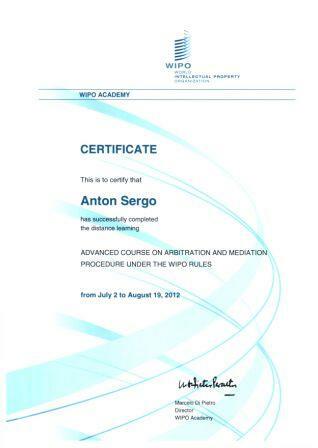 2012 – WIPO Academy’s "Arbitration and Mediation under the WIPO Rules". 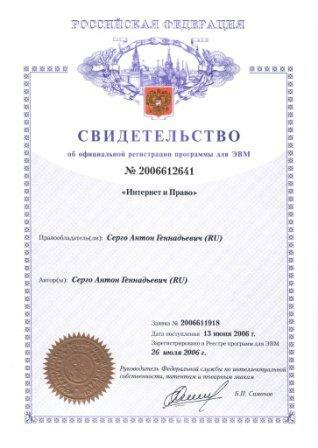 From 1998 until nowadays - President of the "Internet & Law" legal company. 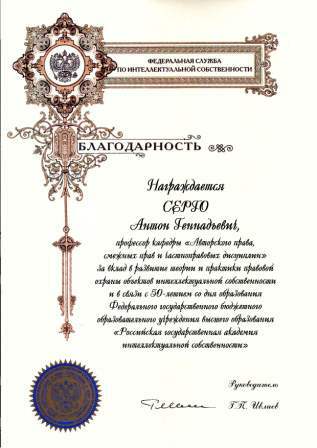 From 2000 until 2010 - The Moscow State Academy of Law, associate professor. 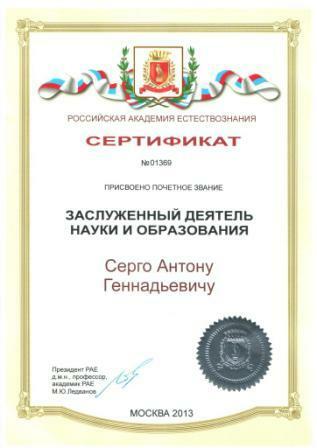 From 2009 until nowadays - the Russian State Academy of Intellectual Property (former the Russian State Institute of Intellectual Property), professor. 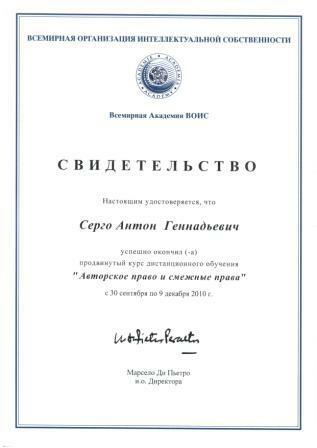 From 2017 until nowadays - The Moscow State Academy of Law, professor. 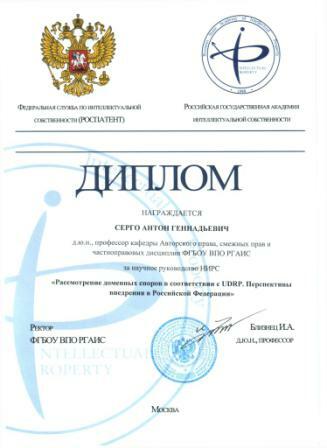 From 2000: UNESCO chair on intellectual property, member (CIS), professor. The first and the only Chair’s expert in intellectual property problems within the Internet. 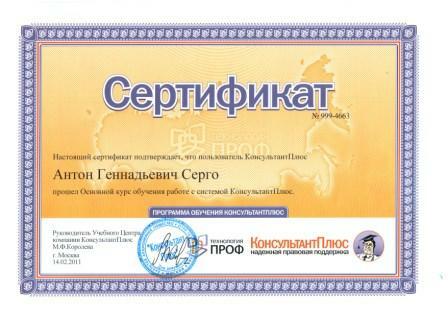 Cooperation with Scientific research center of information legal technologies. 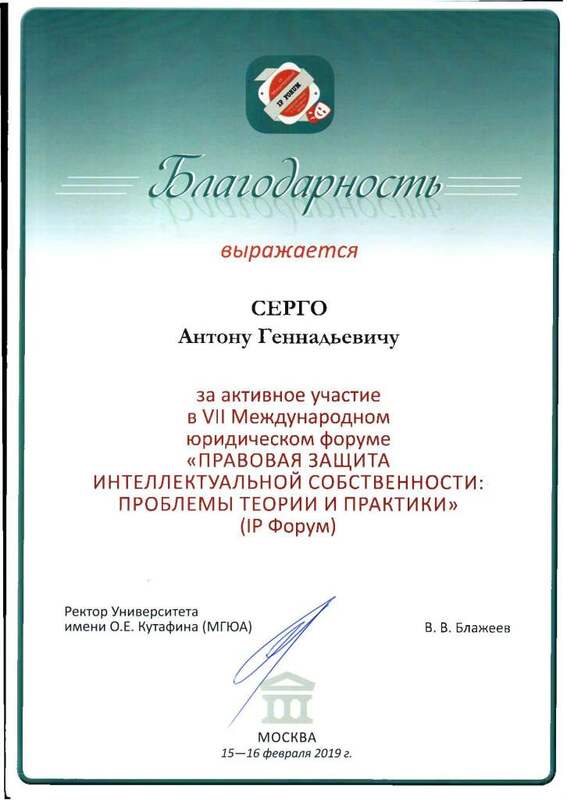 Cooperation with Russian Union of Journalists. 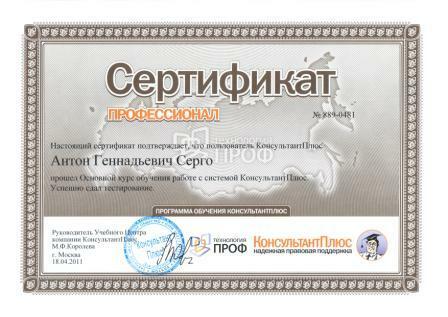 Cooperation with social television and radio broadcasting development Fund. 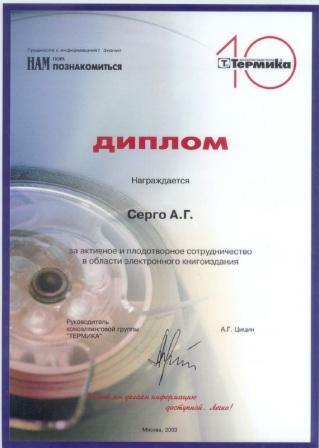 Cooperation with RosNIIROS - RIPN and RuCENTER (NIC.RU). The member of “Information law” editorial board. 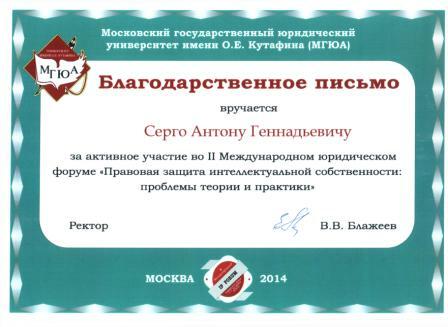 The member of The Russian Internet Forum Expert board. Since 2011 till present: WIPO “Summer School on IP” lecturer. 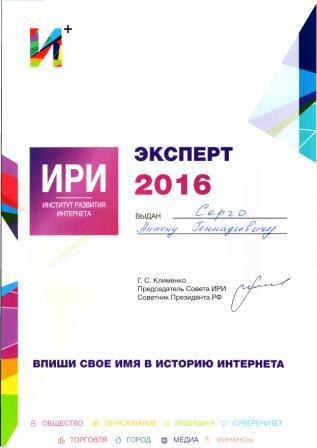 Since 2015 till present: expert IRI (Development of Internet Institute). 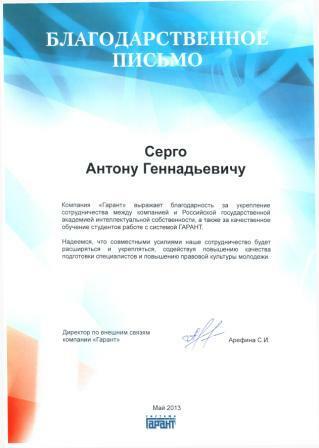 Since 2016 till present: Chairman of the Coordination Center for TLD RU Committee on intellectual property. 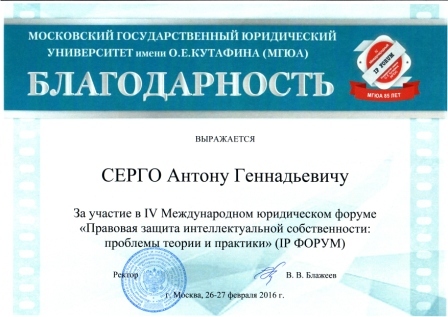 Since 2016 till present: member of the editorial board of the journal "Copyright". 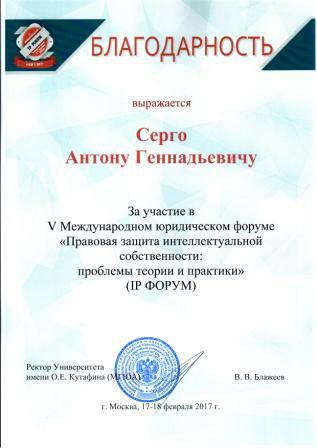 Since 2018 till present: member of the editorial board of the journal "Intellectual property. Copyright". 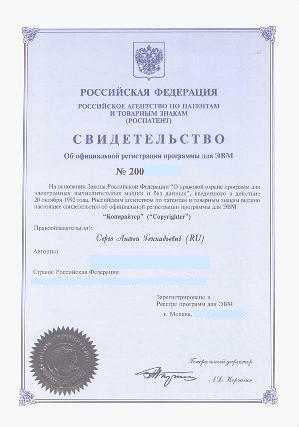 The "Copyrighter" project co-author (computer program, meant for authors' rights and electronic publications defence within the Internet by a special method of publications reflection, which prevents illegal text copying, duplicating or/and modification, 2000. 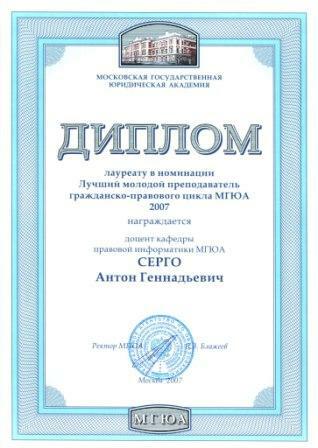 There are more than 300 books, publications, interview on legal subjects in printed and electronic mass media in Russia and abroad, and also 18 books (including 6 monographs, 10 textbooks). 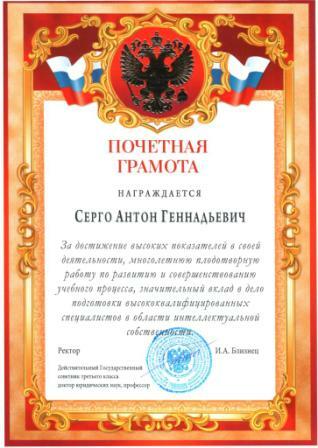 Social and political editions and news agencies: Russian information agency “Novosti”, TASS, ITAR-TASS, Kommersant, Kommersant “Vlast’”, Vedomosti, SmartMoney (Vedomosti), Izvestiya, Noviye Izvestiya, Pravda.ru, Expert, RBC Daily, Ekonomika I Zhizn’ (Yurist), Gazeta, Biznes-zhurnal, Komsomolskaya pravda, Argumenty i fakty, Ogonyok, Marker, Gudok, “Svobodmaya pressa”, Russian Newsweek, Broadcasting, DF (Debt Factor), Lenta.ru, Nakanune.ru, Information agency "Banki.ru", Argumenty nedeli. 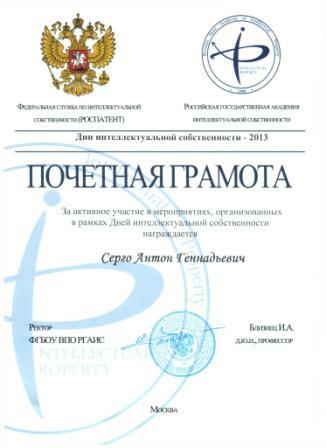 Legal editions: Russian Agency of Legal and Judicial Information, Pravo.ru, Khozyaystvo i pravo, Informatsionnoe pravo, UNESCO chair’s bulletin "Writings on intellectual property", Rossiyskaya yustitsiya, Yurist, Pravo, Intellectualnaya sobstvennost’, Yurist kompanii, Yurist predpriyatiya, Pravo i ekonomika, Novaya advokatskaya gazeta, Kollegiya, Yuridicheaskaya Rossiya, Kodeks-info, Cherniye dyry v rossiyskom zakonodatelstve, Baltiyskiy yuridicheskiy zhurnal (Latvia), Problemy pravovoy informatizatsii (Belarus), Ukrainskiy Yurist (Ukraine). Computer editions: Kompyuter-press, PC Magazine, CNews, Novosty Internet, Kompyulog, Mir PK, Programmist, Khaker, PCWeek, Kompyuterra, Hard'n'Soft, Mir Khostinga, DP.ru, WebPlaneta, TelNews, RUformator. Television broadcasts on channels: Rossiya (RTR), Rossiya 2, TV Tsentr, Stolitsa, Podmoskovye, Tretiy kanal, TV-6, Ren-TV, NTV+, M24, RBC, "Peterburg - pyatiy kanal", Rossiya24 (Vesti24), iTV. 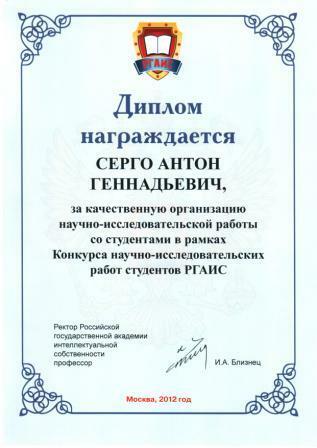 Radio programs on radio stations: RGRK "Golos Rossii", "Ekho Moskvi", "Russkaya sluzhba novostey", "Mayak", “Radio Svoboda”,"Govorit Moskva", VGTRK "Vesti.FM", "City-FM", “Moskva FM”, “Serebryanyi dozhd’”, “Kommersant FM”, "BBC (Russian)", Radio "Komsomolskaya pravda". 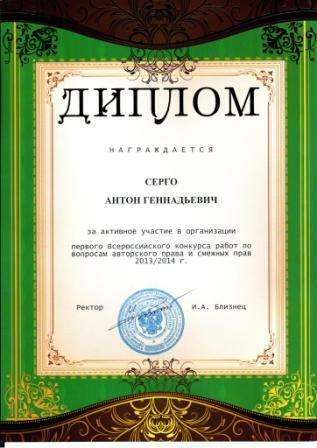 "Internet and Law" book (2003). "Legal aspects of the Internet" e-book (2003). "Informatics and maths for lawyers: the Internet" textbook co-author (2003). The rate of lections “The legal rights of intellectual property”. textbook co-author (2005). "The Internet computer networks and intellectual property", textbook co-author (2010). 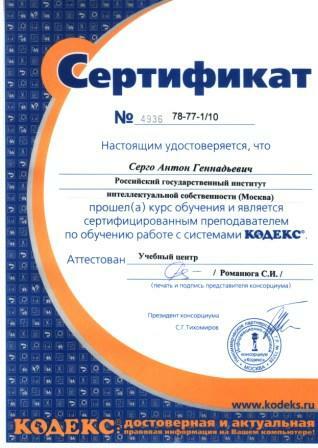 "Usage of reference legal systems “ConsultantPlus”, “Garant” and “Kodeks” in juridical activity " textbook (2010). "The legal rights of intellectual property for IT-specialists" textbook co-author (2011). "Usage of means of individualization and results of intellectual activity in domain names" textbook (2011). "Information technologies in legal activities" textbook (2012). "Information technologies in legal activities. The Internet" textbook (2013). "Disputes on domain names. International systems of their resolution" book co-author(2015). "Usage of means of individualization in domain names" textbook (2017). "Information technologies in legal activities" textbook (2017). "The intellectual property law for IT-specialists" textbook co-author (2018). Linda McCarthy "IT Security", Prentice Hall PTR, 2003 (legal part). Becky Worley "Security Alert", Pearson Educaton, 2004. Arnold Lutzker "Content Rights for Creative Professionals", Focal Press, 2004. ("Copyright defence within the Internet (ways of defence, author's experience")). ("How rights within Internet are defended"). ("Copyright defence practice within the Internet"). 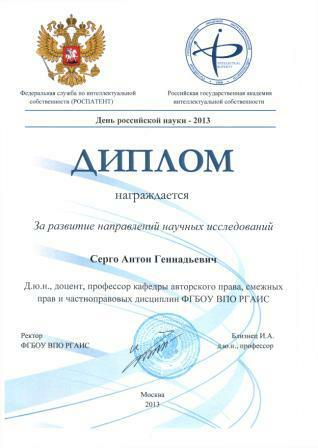 ("Domain sphere judicial problems: Russian and international experience"). 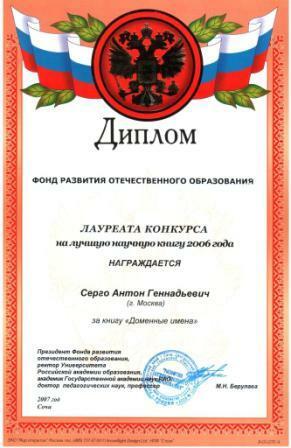 "Law and the Internet" conference - 2003, member of the organizing committee. "Documentation in the information society: paradigms of the XXI century" conference - 2003 ("The Electoric Documents Exchange in the Internet"). Round-table discussion “Press-2004": "Intellectual property and the Internet". 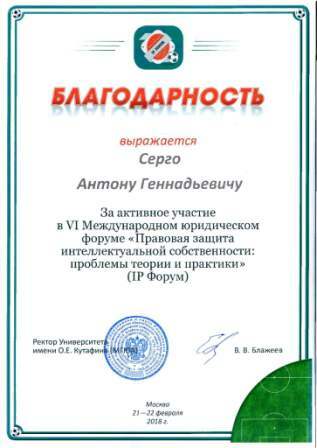 "Telecomunications and New Information Techonology in the Area of Education", MEPHI, the scientific session, VIII exhibition-conference - 2004 ("The Internet & Law"). "Intellectual property and the Internet" conference - 2004 ("Domains: Russian legislation and UDRP"). Round-table discussion "Press-2005": "Intellectual property and the Internet". 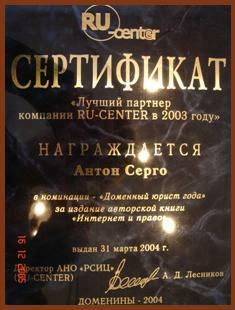 The First anniversary of the Russian Internet (2005), member of expert board. 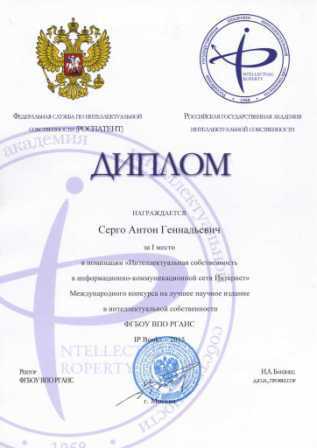 The All-Russian conference "The Copyright: protection and defense" - 2005: the report "The Review of domain disputes in Russia". 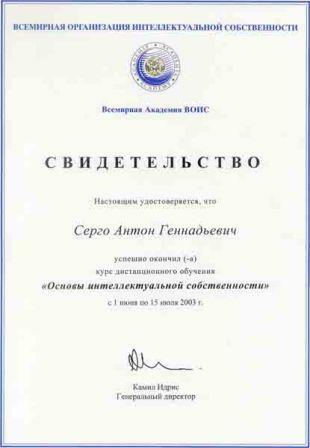 The International conference "The Law and the Internet" - 2005: the report "The Review of domain disputes in Russia". 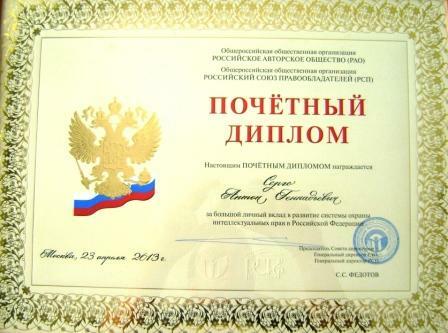 The National award of the Russian Federation "RUNET award - 2005", a member of expert board. The International conference "The Problem of a spam and its decision - 2005": "Is it possible to bring s spammer to responsibility". “Legal aspects of content distribution in the Internet”. report " The Review of domain disputes in Russia ". “The Internet and copyright: that is stronger?..”. «Personal data in the Internet». 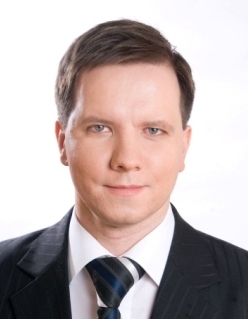 The author and moderator of the site "The Internet & Law" (www.internet-law.ru) - the leader among similar domestic Internet-resources. 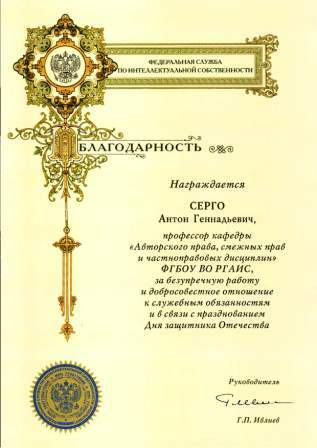 The regular cooperation with commercial, non-commercial legal entities and also private persons in sphere of consultation concerning intellectual property (the copyright, domain names), protection of honor, dignity and business reputation. A number of precedent-setting cases are won in courts.